Creamy, cool and green, wildly popular mashed avocado is the star of the latest customizable station at the University of Richmond. “The menu team was discussing the obsession with avocado and avocado toast, and this idea just evolved,” says Tyler Betzhold, CEC, executive chef. So far, the new station is off to a great start as school begins, going through about 20 to 30 pounds of premade avocado pulp before its even hit its stride. Early on, Betzhold determined that prepping so many avocados was too labor-intensive. “We had been going through three or four cases [of whole avocados] per day, but we’re using pulp now,” he says. The pulp is an additive-free, IQF product that contains only avocado, and comes in 1-pound packs, which helps to keep the color nice and green and not unappetizing gray. The serve-yourself station, set up much like a traditional salad bar, begins with toast or a toasted bagel as the base (toasted baguette and pita points are available as well), a beautiful bowl of mashed avos, and then it’s up to students to “create their own masterpiece,” Betzhold says. Making avocado toast Instagram-worthy for students who choose to snap a pic are colorful add-ons that include everything from arugula to apricot preserves, plus bright pink pickled radish, salmon lox, everything bagel spice, onions, cream cheese, local honey, green chickpeas and balsamic vinegar, to name a few more. 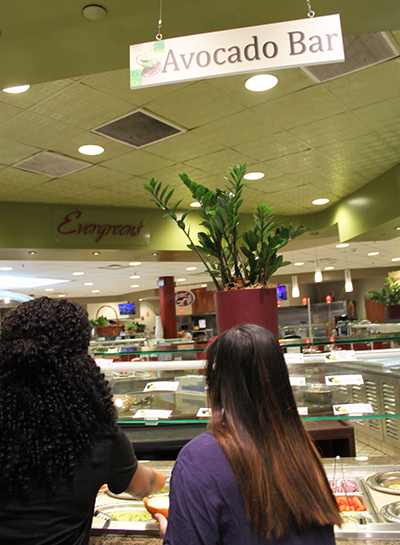 With the success of the avocado bar under their belts, the culinary team is dreaming up new on-trend concepts for the coming school year. Stay tuned for a Mediterranean bowl station, a bibimbop bowl station and a taco truck.